Danny Owens is a Photographer, Creative Producer, and Art Director. 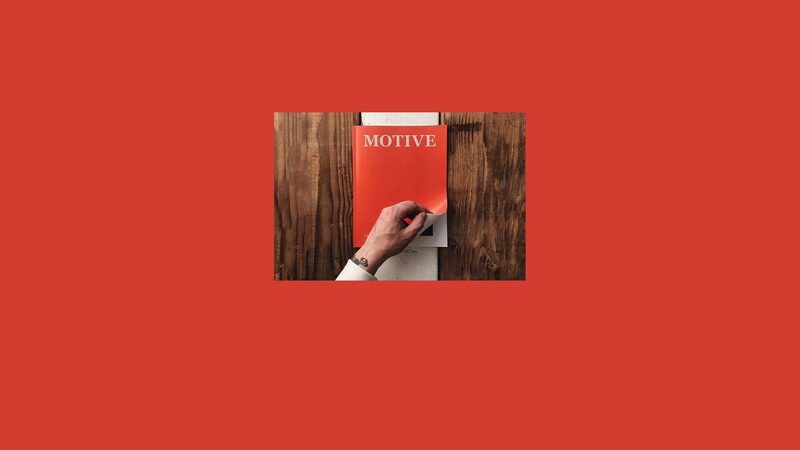 He recently published Motive, a magazine in partnership with Blurb, that features interviews from other creatives and artists about their work and their process. A full-time storyteller who wears many hats, he took the time to talk with us about his first love, photography and his latest project. 1. With so many dimensions to your professional work, what would you say is your main passion? I’ve traveled through a few different creative arenas over the past 5 years. Originally, I was invested in becoming a Graphic Designer, which then led me to the world of photography. In all honesty though, my main passion is storytelling, and that comes in many different forms. Most recently, I’ve stepped a bit away from photography as my main focus and have been redirecting my focus towards creative production. I’m really interested in the larger picture behind the scenes, and it’s allowing me to touch a lot of different creative arenas. 2. What’s your background in photography? When did you start making images and why? The first time I purchased a camera was after winning an art scholarship at school. I had been really diving into art history, and photographers like Sally Mann and Annie Leibovitz were blowing my mind. The way a camera lends itself to storytelling was everything to me. Little by little, opportunities came my way to learn and grow as a photographer—starting with flying to Liberia with a non-profit to capture their story, to stock photography projects, and even planning my own styled shoots. A huge boost to my career was becoming an Instagram Suggested User, which really helped expose me to new clients and opportunities to grow my network. From then on, it was just practice, practice, practice. I never wanted to stop testing out new techniques, or forcing myself to face new challenges. 3. What is your go-to photography gear? I’m really not a technical photographer at all. I think it’s about who’s behind the camera that matters, not what they’re holding. I will say I’ve loved Sigma Art Lenses over the years. 4. Where have you learned the most about photography? Honestly, just from practicing and learning by trial and error. 5. What images inspire you? What sorts of images do you enjoy making the most? I love portraits. I love seeing someone’s life story come through in an image. It’s breathtaking when done well. Personally, I wish I was more of a spontaneous photographer. But lately, I’ve loved being able to plan shoots that have a concept and a team to execute them. I guess it’s my production bug coming out in me. Some of my favorite shoots have been for brands that allow me to capture their product in a lookbook format. However, I think the images that I will always love making on my own are ones that capture a process. I love being invited to shadow someone as they create or construct something. 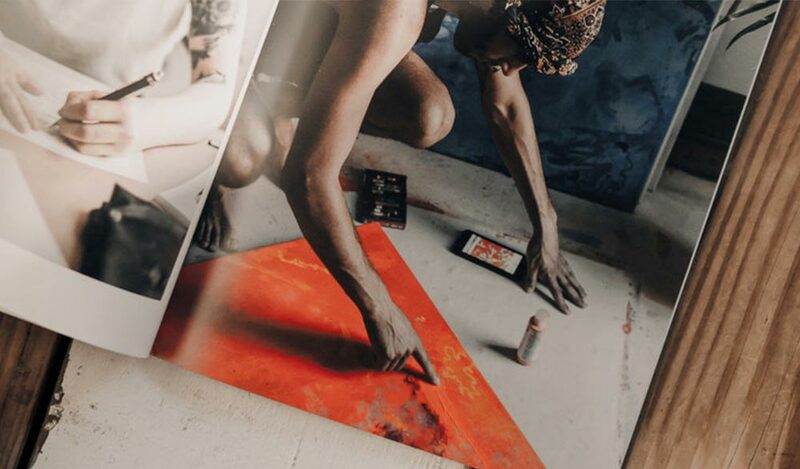 That’s where my artists at work series, highlighted in my zine Motive, really came from. 6. What made you choose the magazine format? What is the relationship between your content and a magazine, and why does it work? I’ve always been drawn to magazines. 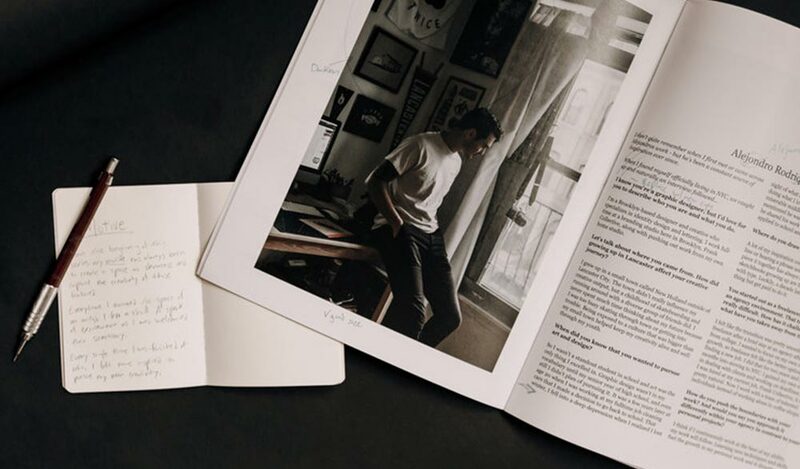 I’m a big fan of flipping through the pages of Cereal, Kinfolk, and others. The format just lends itself really well to photographic stories. So, it was a natural choice when I made my own printed zine. I think it’s all about images that make the reader want to know more. 8. What was your reaction when you first opened and leafed through your finished product? I was really stoked! It’s not often that you get to tangibly hold something you’ve created from start to finish. 9. What ideas and preferences informed the look and feel of your magazine’s design? Designing the cover for me was almost a gut reaction. My personal brand has always seemed to include the color red. It’s bold and says a lot, which is why I went with a simple red cover. I wanted the images inside to be a surprise, while the cover helped it stand out. 10. You create digital images of artists at work in the material world, which is an interesting tension. What is your relationship to print? What role do you think print has in a digital world? I wish print wasn’t losing its role in a lot of areas. It’s sad to see magazines shut down, and more go to digital only. If anything, that’s why I wanted to be able to make my own printed content; to be able to hold on to something I love. 11. What advice would you give someone creating his or her magazine? What did you learn? Just try it. I think it’s a bit daunting to think about creating something that will live in the physical realm. We’re all so used to being able to delete or archive what we put out into the world. I learned that nothing beats the pride you’ll feel when you hold something you know is your creativity realized. Now that I’ve put Motive out in the world, I want to keep the momentum going. I would love to continue to interview and photograph creatives at work. I’ve been thinking of expanding beyond artists too. In my next volume, I would love to include other types of work that are done by hand. The possibilities are endless but I would love to connect with farmers, carpenters, chefs, and others in that vein. Also, I would love to create something printed on newsprint. Thanks, Danny, for taking the time to talk with us. 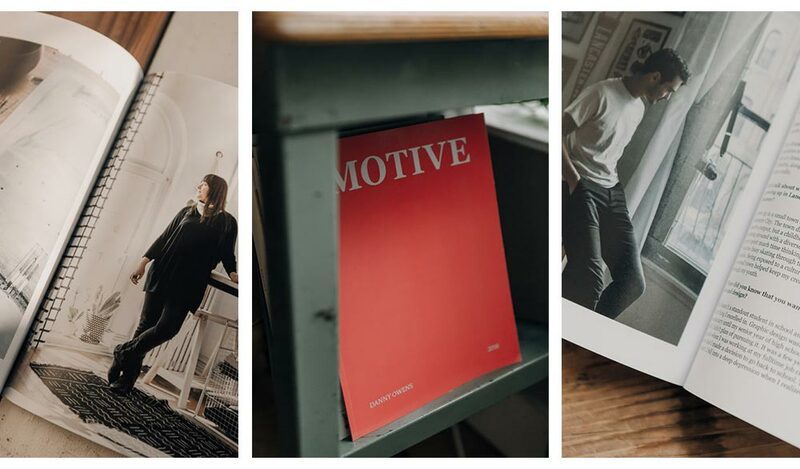 We’re really enjoying Motive and we can’t wait to see what you do next! Want to create your very own Magazine? Design everything from scratch or start with one of our fully-customizable templates with layouts for editorial features, mastheads, and more. Get started today!